It is the rare soul in any age that can look to the future and see potential; what can be, rather than the problems, trials and obstacles that stand in the way of a great idea. The Right Reverend Isaac Hellmuth, second Bishop of the Diocese of Huron, was such a man. A thoroughgoing evangelical Anglican Christian unwilling to compromise his religious principles, Hellmuth understood the Church's duty to education and the development of the whole person. And while the execution of his plans often left people disgruntled and angry (for uncompromising prelates rarely garner universal admiration), his legacy is a tribute to his remarkable powers of persuasion - the cajoling, begging, threatening, wheeling and dealing required to convince the people of his day that London needed a university. It may come as a shock that our modern secular university was born of the church, born of the theological arguments that marked 19th-century Canada. The Church of Ireland influenced heavily the new Diocese of Huron, founded in 1857, and it had a fiery, Irish-born Evangelical bishop at its head - London pioneer Benjamin Cronyn. He decided a theological college should be founded in London to ensure there would be enough priests for the Church of England in his diocese who were trained according to his evangelical opinions. The college would stand in opposition to many "high-church" principles being taught at Trinity College in Toronto. Thus, Huron College was founded in 1863 - after Bishop Cronyn had found in Isaac Hellmuth the right man to head up this new endeavour. Isaac Hellmuth was a rare combination even in 19th-century circles. Born in Poland of Jewish parents, his father was a rabbi and Hellmuth himself trained to be a rabbi. While being educated at the University of Breslau, his religious convictions changed in conversation with missionaries from the Lutheran Church and the Church of England. Disowned by his father for his conversion, Hellmuth took his mother's name and moved to England. To this day, his father's name remains unknown. Arriving in Canada in 1845 and looking for a future within the Church of England, Hellmuth found his life's work, beginning in Sherbrooke, Quebec, as Rector of the parish and as a professor of Hebrew for the fledgling Bishop's University in nearby Lennoxville. Respected as a lecturer and a professor, he was also proficient in raising funds for Bishop's, generating £1,000 one summer on a fundraising tour. Hellmuth's single mindedness assisted him in his fundraising activities, but it also cost him in goodwill; following a dispute with other faculty members (the details of which are unknown), he resigned his chair at the university, and later his rectorship in Sherbrooke, to become General Secretary of the Colonial Church and School Society of London, overseeing their work in British North America. It was during his travels for the Church and School Society that Hellmuth met and became friends with Benjamin Cronyn - who had a problem. Cronyn wanted clergy for his diocese, and he wanted his own college to train them. But he wanted teaching that he felt he could trust from a professor he agreed with, and he needed someone who had the connections and the ability to raise the funds to found a school. All these needs came together and were met in Isaac Hellmuth. So in 1861, Hellmuth set off for England to raise funds for this new college and once again found himself embroiled in controversy. He was accused of casting aspersions on Bishop's University, and much ill will was fostered in the religious press in both Canada and the U.K. when Hellmuth was accused by Bishop Fulford of much wheeling and dealing and enriching of himself. Hellmuth fired back that he had no recourse to the ecclesiastical courts to have his reputation restored as the one who was his accuser was also the judge: the Bishop. The controversy finally died down when Bishop Fulford refused to be drawn into any further discussion. To one Alfred Peache, a priest of the Church of England and another man of uncompromising Evangelical convictions (who would later become Western's chancellor), this was enough to prove Hellmuth's point and so he endowed the new Huron College with £5,000 of his own money. As proficient at begging as lecturing, Hellmuth soon had raised enough funds to open and operate the College. He was hired as a professor of Rabbinical studies and Old Testament and named Huron's first Principal, where a primary part of his job was to raise funds for the College in England and promote the cause of Evangelical Anglicans in Upper Canada. Money was always short but enough men were ordained that the fledgling Diocese began to grow, as did the College. 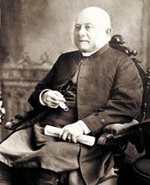 In 1871, Hellmuth was elected as Benjamin Cronyn's successor thus becoming Bishop of the Diocese whose clergy he had been training since 1863 - while also continuing to be a lightning rod for controversy. Repeatedly, he butted heads with those who might oppose him in any great or small work. But it is in the founding of the Western University of London, Ontario, that we clearly meet the visionary and the single-minded, uncompromising prelate. To understand Western's founding, one has to return to an age where the accepted colonial policy of the day was to have just one strong university serve all students of the region in Toronto. Whether it was begun as an idea of the faculty and alumni of Huron College or his own idea, Hellmuth saw that a university also needed to be founded in London, so he pledged $10,000 of his own money and whatever else he could do to procure a charter for the new school. The London community was not unanimous in believing that a local university was a necessary thing, and the papers were filled with letters to the editor both in support of and in opposition to the idea. The enabling legislation met stiff resistance, but wove its way through committees of the legislature - no doubt assisted by the fact that Hellmuth was married to the sister-in-law of the Minister of Education. The bill granting a charter for Western was eventually authorized in 1878, but only after an impassioned speech by Premier Oliver Mowat. The next controversy arose after the Huron College alumni agreed to purchase the defunct Hellmuth Boys College, which would later stand in good stead when Huron College was made the Faculty of Divinity of the new university. The fact that in acquiring Huron College (and with it the old Hellmuth Boys School), the University also gained a fully equipped building while the Bishop unloaded a piece of real estate he was keen to be free of, and that he also managed to become chancellor of the University at the same time, caused some tongue-wagging in letters to The London Free Press. But, as usual, Hellmuth's detractors were met with facts as put forth by his keenest supporters, and the controversy passed. Modern graduates of Western tend to be unaware their alma mater was originally a church university and that its first Faculties were Divinity and Medicine, which operated side by side in the same building. Its first teachers were clergymen of the Church of England, and its first chancellors were the Bishops of Huron. In fact, in the beginning the Faculty of Arts closed down for a time, which seems a long way away from the massive institution of learning, with some 190,000 alumni from 130 countries around the world, that has grown from its church roots. Hellmuth worked tirelessly to see that the fledgling university survived. However, consistent with his pattern, he didn't manage to retire and leave his life's work without a controversy. Hellmuth tendered his resignation very suddenly in 1883 after procuring for himself a position in England. The Bishop of Ripon had appointed him Suffragan Bishop (Assistant Bishop without right of succession) in the Diocese of Ripon, and Queen Victoria had assented to the appointment. With a farewell to the Synod and Western, he left for England and was immediately embroiled in another administrative controversy, this time through no fault of his own. The letters appointing him to assist the Bishop of Ripon were ruled invalid and his title and responsibilities had to be changed. Another misfortune befell Hellmuth when his wife, Maria, died. It was during this time that he resigned as Western's chancellor and turned his attention to caring for the parish of Bridlington, where he died in 1901 and was buried in the priory churchyard. Like many great men, Isaac Hellmuth suffered personally for his drive and ambition. But the overarching legacy of his career was that the vision he had for education, his desire to develop this part of the world, and the university he dreamed of, all came to fruition. Hanging in the Great Hall is the portrait of the little man from Poland dressed as a prelate of the Church of England. He still presides over our University from his painted vantage point, as his legacy has grown beyond even his own vision, beyond even what he could, as the scriptures say, "ask or imagine." And, if you look closely, he is smiling. Bill Cliff is a Chaplain at Huron University College. He is grateful for the work of A. H. Crowfoot's Biography of Hellmuth "This Dreamer," and J.J.Talman's 1963 history of the founding of Huron College, and the late John Gwynne-Timothy's 1978 history of Western. Thanks also to Diana Coates in the Diocese of Huron Archives at Huron University College, Jan Van Fleet of the University Secretariat, and The Reverend Dr. Douglas Leighton of the History Department of Huron University College.